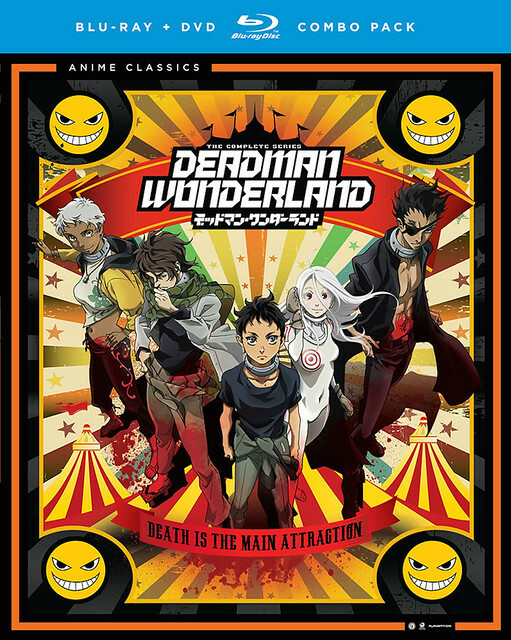 Deadman Wonderland [1080p-BluRay] [UNCENSORED] | Gamerzplanet - For All Your Online Gaming Needs! Discussion in 'Anime' started by MaReaL, Mar 9, 2015. A massive earthquake ravaged Japan's mainland and destroyed most of Tokyo, sinking three-quarters of it into the ocean. Ten years later, the story starts with Igarashi Ganta, a seemingly ordinary, unassuming middle school student attending Nagano Prefecture's middle school. An escapee, a survivor of the great earthquake, Ganta has no memories of the tragedy and has lived a simple, normal life. This all changes one day when a strange man covered in blood and crimson armour appears, floating, out of his classroom windows. Smirking madly, this Red Man massacres Ganta's entire class and, instead of killing him, embeds a red crystal shard in his chest. Within days of the massacre, Ganta is declared the sole suspect and, following a suspiciously quick trial, is sentenced to life imprisonment in Deadman Wonderland, a massive theme-park-like prison.